We spent a night of our brief Thanksgiving tour brought us to the Historic Route 66 town of Holbrook, Arizona. This is the town closest to Petrified Forest National Park and therefore offering various traveler services. Like most Route 66 towns it offers a variety of oddities and minor attractions. We feature a couple of them below. No one is allowed to remove petrified wood from the national park. However several rock shops in Holbrook offer a wide variety of petrified wood souvenirs. These range from small polished (very beautiful) or unpolished pieces for less than ten dollars to fantastic coffee tables made from slices of enormous petrified tree trunks for thousands of dollars. 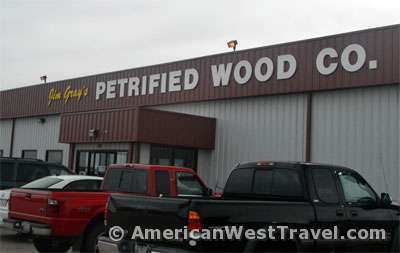 Jim Gray’s Petrified Wood Company is the biggest and best of the local rock shops. Their building is surrounded by acres of yards full of petrified wood pieces large and small, a fantastic sight. All of their wood is purchased legitimately from local landowners. (The Petrified Forest extends well beyond the national park’s borders.) Another yard contains petrified wood pieces and various raw minerals and crystals which can be purchased by the pound. Many people take the challenge of cutting and polishing these minerals into their own artwork. Inside you will find a huge gift shop and a fantastic little museum (photo, above – note the “coffee tables” in the foreground) housing Mr. Gray’s collection of artifacts. 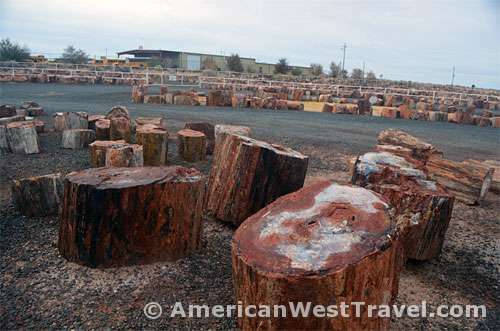 Besides fabulous pieces of Arizona petrified wood, various petrified woods in all kinds of fantastic colors and shapes from around the world are displayed. There is a tree trunk, about four feet high and a foot across whose top had been cut flat and polished – with a price tag of $49,000. The collection also offers a wide variety of animal fossils which are generally prevalent wherever petrified wood is found. These are generally fish or smaller animals or reptilians. The Arizona petrified wood came from the Triassic Era when dinosaurs were just starting up. So dinosaur bones are few, and when found are generally small. The gift shop offers a tremendous variety of petrified wood in all sizes and shapes and prices large and small. One of the better souvenirs are polished cross sections of branches and trunks. This is because crystallization takes place within the wood (bark doesn’t fossilize) and cross sections will often show crystals with all kinds of fantastic colors (based on what kind of minerals the tree absorbed). These pieces are more expensive as cutting petrified wood is a slow and arduous process. 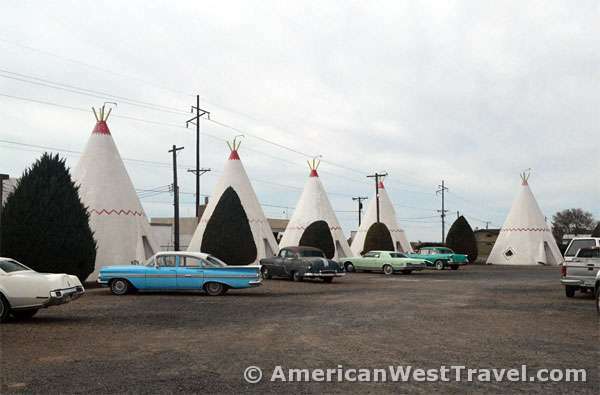 Holbrooks’s most iconic landmark during the Route 66 had long been the Wigwam Motel. Each motel unit has a standalone cabin shaped like an Indian teepee. It originally had closed in 1974, a few years after Route 66 had been bypassed in this area by I-40. In the late 1980s, the Historic Route 66 era had started where the remains of Route 66 and its towns became viewed as an immensely popular tourist attraction. The movement began in northern Arizona. 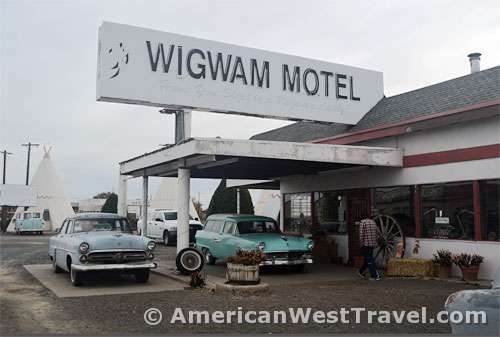 The Wigwam was refurbished, and reopened in 1989, and is once again a highly popular Route 66 attraction and a popular place to spend a night. To add to the authenticity, the management has placed a bunch of classic 1950s-era cars throughout the parking area in front of the teepees. It’s particularly cool if you check it out in the middle of a weekday when there are few guests around with their modern cars. More Historic Route 66 articles….